There's only one holiday that comes four times a year: November 1, December 26, February 15... whatever the day after Easter is... it's Discount Candy Day! Anyway, our point is, Easter may have been last week, but there's a precedent for not reviewing this figure until now. Bucky made his mark in the United Animals of the Aniverse Space Service battling giant cybor spiders during the Great Clone Uprising on Rigel II. He was awarded the Bronze Fur Ball with Zinc Palms for his role in subduing the Mutant Weasel of the Vegan Slug Lords. Bucky is a Knight Commander of the most Secret and Glorious Galactic Order of the Silver Carrot which grants him a lifetime's supply of vintage, purple colored Vegelain III carrots. A true Aniverse delicacy. Bucky can be found standing on the bridge of the Righteous Indignation looking at danger head-on, the stench of hot ions in the air, and the sight of toad laser pulses reflecting off his goggles. He's not just some rabbit who looks good under fire. His crew doesn't follow him because of his bubbling personality or because he shoots a man laser blaster. They follow him for his ability to take charge of a desperate situation and turn it around in his favor. Now that's a real leader! 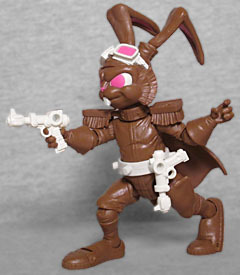 Boss Fight Studio, they of the Vitruvian HACKS line, has brought back '90s flash-in-the-pan property Bucky O'Hare for modern action figures. They started with Bucky and his space-girlfriend Jenny, with more on the way. But this January, they announced an exclusive "Holiday" Bucky, available only through their website. And the fact that it arrived only a week after Easter is terrific timing! 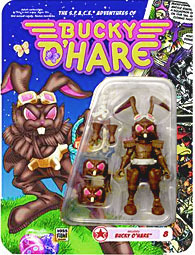 The gimmick of this figure is that rather than Bucky's usual colorscheme of green fur and a red and yellow uniform, the entire thing is molded in brown plastic, then given minimal white and pink paint apps - it's meant to represent a chocolate bunny, just like you'd get for Easter! (Or for half price the day after Easter). Boss Fight really did a great job on it, too: brown is not an easy color to mix, but this toy is a perfect shade to look like milk chocolate. Like, it's standing right here in front of me as I write this, and I still have to remind myself that it's plastic, not food. Despite the fact that the packaging clearly states "Not actual candy. Tastes terrible." 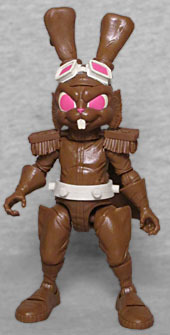 Bucky O'Hare is a space rabbit - or, to be specific, a SPACE rabbit. It's an acronym. Anyway, being a space captain (or a SPACE captain) means he wears a military-style uniform complete with boots, gloves, jodhpurs, epaulettes and a cape. Normally those would all get their own paint apps, but the solid color here allows you to appreciate the sculpt more. There are realistic wrinkes leading up to his collar, and his little pot belly strains against his belt. 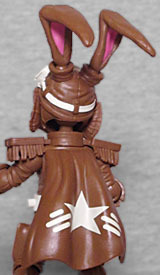 The strings hanging from his shoulder boards are sculpted with a slight flow to them, rather than being purely straight, and there are lines on the bottom of his boots to suggest treads. 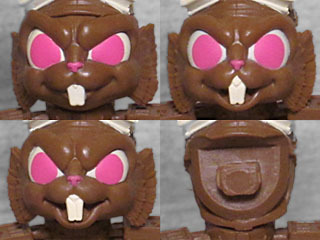 As mentioned, the paint on the figure is limited to pink and white - his eyes and the goggles that are pushed up on his forehead get both, his teeth are just white, and his nose and the inside of his ears get the pink. They probably could have gotten away with leaving the goggles brown, but this adds a little extra flair. After all, there's no reason his belt needs to be white, or for there to be a star painted on his cape, but that just makes the overall toy look cooler. Buck has wonderful articulation. We're talking hinged toes, swivel/hinge ankles and knees, balljointed hips, balljointed waist, balljointed tail, swivel gloves, swivel/hinge elbows and shoulders, double-balljointed neck, and balljointed ears. Additionally, his cape plugs into the back with a single peg, so technically that can act like a swivel, making it look like his cape is blowing in the wind. The only thing that's even a little loose are the hinges in the toes, but even that's not enough to keep him from standing well in many different poses - you just need to find the balance point that take his ears into account. Holiday Bucky O'Hare gets all the same accessories as the regular release, colored to match the theme. (Unfortunately, that means he doesn't come with the pretty blue Easter basket he's shown holding in the card art.) There are two white pistols that he can either hold in his hands or plug onto his belt. The hands he has on in the package are open to hold the guns, but we also get a pair of fists, and a pair that's gesturing: the left hand is pointing, and the right has all three fingers splayed. Were that not enough, you'll also get your choice of three swappable faces: one with the mouth closed, and two with the mouth open, all with (minorly) different positioning on the eyebrows. The faces just plug onto the head via a thick, squarish peg. On the mouth-open heads, the teeth are separate molds inserted through the back of the piece, so that the paint doesn't get messed up. 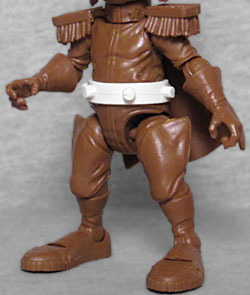 Boss Fight Studio's Bucky O'Hare toys are surprisingly expensive, so I sadly planned to pass on them. But this exclusive Holiday deco, limited to only 400 pieces, absolutely hooked me. It's a clever idea, executed well, and it turns out the base toy might be worth the price after all. Now the only question is, how can they follow this up? A version of Series 2's Dead-Eye Duck, painted all-yellow to represent a Peep?